This church was one of four thriving churches that existed in Bridgtown in the first half of the twentieth century. It was originally called East Street Primitive Methodist Chapel. Historical records say that the chapel was built in 1897 but maps of the area clearly show a chapel on the site as early as 1882. It must be surmised that the Primitive Methodists were meeting on that site early in the life of the village in a smaller, perhaps temporary, building. 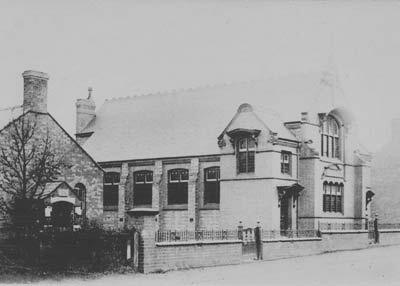 The 1897 chapel was constructed under the direction of Mr William Whitehouse. It was a fine red-brick building which was quite imposing. The smaller building to the left of the main picture was constructed in 1928. This building was used as a Sunday School and for the Ladies’ Guild meetings. In 1932 many different forms of Methodism came together as parts of one organisation. At this point the name was changed to Carmel Methodist Church. It was a very busy church, organising lots of events for its members and the community. Music played an enormous part in the life of the church with Sunday School Anniversaries particularly impressive. All the girls used to dress in white on such occasions, with the boys in their “Sunday best”. During the 1930s the anniversaries were conducted by Mr Hayden Boot who was something of a “legend” in Bridgtown musical history. He wasn’t very tall and would place two planks across the pews so that he could stand on them to conduct the singing! After World War Two, congregations began to diminish and eventually the church was closed in 1948. In 1956 the buildings were eventually sold. They were used as a Frozen Food Centre and then as a warehouse for D.W.Clarke & Son, the company that had a large department store in Cannock Town Centre. Nowadays a block of apartments stand on the site.